A thousand posts doesn’t mean a thousand programs, of course — the total number we’ve seen (if you actually stuck around from the beginning) is much higher than that. After all, the original list that I had from half a decade ago had close to 1,000 on it when I meshed it with some others, and I’ve been adding suggestions as we went along. The math might not seem to work, but the total number of programs checked is probably well over 1,500. Keep in mind that there are some that have faded away, others that were too esoteric for me to use or understand, a lot that just wouldn’t build, and entire categories that I dismissed out of hand. Plus another whole bracket of modules and modes (think: vim and emacs) that I’m tiptoeing around, because it opens a whole new can of worms. So don’t feel cheated if I tell you there have been half again as many programs as there are posts. I’m not trying to trick you somehow. Just to prove my goodwill, I have a marvelous console game for you today: ttysolitaire. My attraction to this is probably obvious from the get-go: Color like that wins points in my book, any day of the week. The other strong point — and possibly a stronger point — is simply that ttysolitaire’s controls are fast and easy. Arrows to move your selector. Space to pick up and drop. M and N to hold stacks of cards. Q to quit. 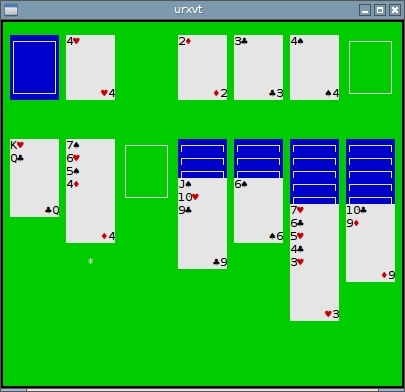 It takes all of about 10 seconds to achieve warp speed with ttysolitaire, and after that you won’t miss the mouse for a second. Only two (very) small admissions with ttysolitaire: First, I’m going to guess that the suit characters aren’t visible in your virtual console, unless you know about a font that I don’t. It might be nice to see a command-line switch for H-D-S-C, for emulator-less gameplay. Second, ttysolitaire needs a slightly odd minimum terminal size — I think it’s 57×28, if I remember right. It will run at larger dimensions just fine, but it does mean the classic 80×24 (or 25) is a no-no. Like I said, those are both exceedingly minor. And since ttysolitaire looks so good and plays so fast, I’m more than willing to overlook them. By all means, accept a coveted K.Mandla gold star, and the honorary spot of post 1,001: ⭐ 😉 Enjoy! This entry was posted in Linux and tagged game on 2014/09/15 by K.Mandla.